Lowering energy intensity is arguably our most important tool to achieve a sustainable energy future. 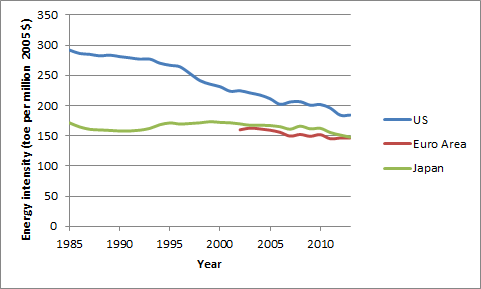 Developed nations have reduced energy consumption since the financial crisis and the US has seen continued GDP growth. 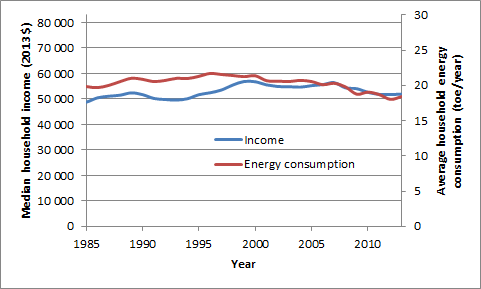 However, household income (a proxy for living standard) has declined with energy consumption in the US. This trend poses serious questions about the feasibility of continued increases in living standards despite reductions in energy consumption. A lot has been written recently about the decoupling between GDP and energy. This decoupling (shown for the IEA New Policies scenario below) is generally viewed as a central part of the solution to the sustainability problems we face in the 21st century. Decoupling between economic growth and energy consumption is often attributed to energy efficiency, but in actual fact stems primarily from the general transition to more service-based value creation as economies mature. As an example, the graph below plots energy intensity in the US against the fraction of the economy dedicated to manufacturing (the balance being services), revealing an almost perfect correlation. Developing nations can therefore be expected to achieve substantial reductions in energy intensity over the coming decades as value creation is shifted more towards services. Developed nations, however, may be at the point where the economy is saturated with services, thus posing questions about whether these nations can further reduce energy intensity at meaningful rates. The ideal scenario in terms of decoupling is the achievement of a growing economy despite declining levels of energy consumption. Several developed economies have recently managed to achieve this goal for the first time in recent history following a seemingly structural change in energy consumption patterns after the great financial crisis and the spike in oil prices. Between 2007 and 2013, primary energy consumption declined by 4.5%, 6.6% and 10% in the US, Euro Area and Japan respectively. However, as shown below, the US economy is the only one which managed to achieve any meaningful improvement in terms of per capita rate of production during this period. Note that the graph below uses NDP (Net Domestic Product) rather than GDP to better reflect actual production of useful goods and services (the primary difference between GDP and NDP is that NDP subtracts capital writedowns). Numbers are adjusted for purchasing power parity and inflation and were extracted from the OECD website. The use of NDP instead of GDP makes the US look better since capital writedowns are smaller relative to Europe and Japan, but I think this is a more representative measure than GDP. Overall though, the above graph suggests that US citizens are rapidly expanding the already large gap in living standards relative to their European and Japanese counterparts. As shown below (energy numbers from the BP Statistical Review), the US is also achieving rapid reductions in energy intensity and, although it still has some catching up to do, progress is better than in Europe and Japan. Overall then, the US appears to be the shining light in the story of continued economic expansion despite declining energy consumption. But is this really the case? In fact, an important worrying trend in the US has now gone on for so long that it is actually becoming a mainstream issue: stagnant wages. To summarize, when adjusted for inflation, current median household income in the US is at the same level as it was in 1995 – two decades ago! This is quite surprising given that NDP/capita has increased from $30000 to almost $40000 between 1995 and 2013 in the above graph. 1. Increasing profits. Businesses have been paying their workers a progressively smaller share of total revenue over the past three decades and using the resulting increasing profits to expand, pay more dividends and stockpile cash. In general, this trend implies that investment is increasing relative to consumption. 2. GDP deflator vs. CPI. GDP (and NDP) are adjusted with time via the GDP deflator which standardizes the value of domestic production, while wages are adjusted using the core inflation which tracks prices of a representative basket of goods and services (local or imported). 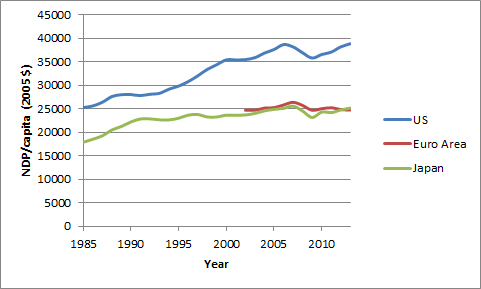 This trend implies that the cost of living has been increasing faster than the cost of domestic production. 3. Increasing inequality. Income inequality in the US is rising sharply once more, thus reducing median wages relative to mean wages. 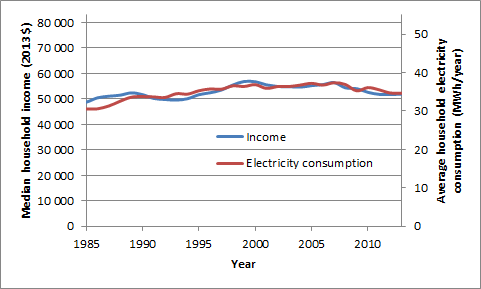 As a result, there appears to be very little decoupling between real household income (here seen as a proxy for living standards) and energy consumption. Income data in the graph below is from the US Census Bureau. It is clear that, from the time that household energy consumption actually started a structural decline (around 2000), the general standard of living in the US has declined in tandem. When looking at electricity consumption in the graph below, the trend becomes even stronger right across the 30 year sample period. These trends pose some serious questions regarding the notion that rich nations can continue to increase living standards without increasing energy consumption (and the associated environmental impact). If it is really this difficult to achieve decoupling in nations enjoying decent standards of living, the world will need to quadruple energy consumption in order to bring the global population to current developed world standards. This will not be possible without some real technological miracles. One would therefore very much like to believe that Europe and Japan will one day manage to achieve a meaningful economic recovery and that the recent divergence between household income and domestic production in the US will reverse. However, Japan has recently completed its second “lost decade” while Europe followed suit with its first. In addition, one can argue that persistently low wages coupled with increasing inequality are an important part of the reason why US GDP could continue expanding while Europe and Japan stagnated. What do you think? Will the developed world be able to successfully decouple living standards from energy consumption? What needs to be done to break the worrying trends discussed in this article? Is it though? I think it’s far easier to argue that cleaning-up power generation is the most important tool. After all, we can never reduce energy intensity down to zero, but we can certainly reduce the environmental impact of power generation to (near)zero. Moreover, achieving large reductions in energy intensity doesn’t help us much while energy generation remains ‘dirty’, and while global energy demand is still rising. For what it’s worth, I get the feeling that energy efficiency is often oversold. Especially when ‘energy efficiency’ is made out to be an ‘energy resource’ in the popular press. It is no such thing, of course. Efficiency is great if it improves prosperity and helps protect the environment, but there are clear limits to how far efficiency can be improved. Au contraire. We can quadruple energy consumption, easily, cheaply, cleanly, and forever. No technological miracles are needed. Schalk, the U.S. and other service economies achieved much of their emissions reductions by outsourcing manufacturing to China. China will eventually do the same to another country farther down the economic totem pole, et cetera, making national carbon intensity figures irrelevant. But there’s little evidence any of the world’s nouveau suffisant will be less consumptive than their forebears, so manufacturing will increase unabated for the foreseeable future. Improvements in standard of living are inversely correlated with population growth, suggesting the possibility of stabilizing global population without famine or conflict. But corralling enough energy to do so without catastrophically altering climate will only be achieved by employing nuclear energy to prevent dumping more carbon into the atmosphere. The sooner we divest ourselves of distractions like renewables, efficiency, and storage, the more attainable that goal becomes. I agree with you on the importance of achieving economic development in the developing world for the sake of stabilizing and eventually reversing population growth. This will in itself lead to a wide range of demographics-related problems due to the inversion of the population-age pyramid, but is easily the most morally sound population control mechanism we know of. Another important reason to increase developing world standards of living is to get environmental issues somewhere near the top of the list of priorities of the average member of society. Expecting the 2.5 billion people that still live below $2/day to care about climate change is not very realistic. Although I agree that nuclear should play a much larger role than it currently does, a technology-neutral “all of the above” approach is surely the best way to approach the quadrupling in energy consumption required to achieve this goal. Continued technology forcing of wind & solar is in my opinion doing substantially more harm than good, but there are many locations on earth where these sources can and should make a significant clean energy contribution. Sure, but still, doubling global energy consumption within planetary boundaries will be a heck of a lot easier than quadrupling it. The current consensus for 2 degrees C modelling scenarios is that energy consumption will only increase by about 20% even though global GDP more than triples up to 2050. Not many scenarios consider a leading role for nuclear. Going from this consensus to one where energy use rises much more aggressively while nuclear rapidly displaces other forms of generation will require some pretty major events. I totally agree with the fundamental promise of fast reactors, but they have been under development for 60 years without delivering much. Would you care to venture a guess about when these reactors will finally make a breakthrough as a mainstream economically viable energy option? I can’t see anything but utter dominance by solar PV, batteries, and electric motor transport over the next 10 years. The solar PV + batteries + electric motor formula just pisses investors off because there’s such a big front end investment and we largely cannot use any of the infrastructure we built for oil and gas over the last 100 years. Yes some of it we can use, but much of it’s wasted. Plus solid state technology likes other solid state technology. Solar panels and batteries play much better with software and computer chips than mechanical based fossil fuel technology. And the one factor that will guaratenee solar PV dominance? Water usage! Nuclear and fossil fuel power houses cannot even be considered in a lot of places in the US anymore, simply no water for it. Except that neither NDP nor GDP measures living standards … they both measure production. Adjusting production for write-downs of capital may well make it a better measure of the production that is available to contribute to an increase in the standard of living, but it would be silly to assume that this is the most important source of discrepency between GDP and standard of living. … but given that these are observations of economies working without such a policy framework in place, they can not serve as direct evidence in support of a thesis that no such policy framework can work. Windpower does not require water … and if you are charging overnight between getting home from work and heading off to work, there’s more likely to be wind presently blowing somewhere in the country than sun shining, so it saves much of the capital cost of using solar PV to charge batteries which have the purpose of charging a different batery later. And nuclear power only involves substantial water consumption if that is what it is designed to work with … if it uses dry cooling it doesn’t. The electric cartopia with solar PV and batteries may make a compelling vision (which may help explain Elon Musk’s involvement in that complex, since he seems to be drawn to fully hype-ready technologies), but its likely to be only one fairly moderate part of the transition over the coming decade. Not if you use nuclear power to do it. If you use nuclear power, you are not assaulting planetary boundaries. Increasing global energy consumption 2 times, 4 times or 10 times doesn’t make much of a difference when nuclear technology is used. But presumably in the second half of the century, uranium prices will start edging up (assuming there is a major global expansion of conventional nuclear power). When the price level of mined uranium comes near the cost of reprocessing spent nuclear fuel, breeder reactors will be the cheapest way to generate nuclear power, all things being equal. Due to the low uranium consumption of fast breeders, the price of uranium can increase a hundredfold and it wouldn’t matter for the price of nuclear power. At such high uranium prices, the uranium resource becomes inexhaustible. Uranium in ocean water, in coal ash, even the uranium in the soil in your backyard, it all becomes part of the global uranium reserve. Humanity will never be able to burn it all, because there is simply so much of it to burn. In the nuclear industry, the general expectation is that commercial breeder reactors will be built in the second half of the century, for the above reason. On the other hand, certain types of breeder technologies have additional benefits, namely technical simplicity, increased operational safety and proliferation resistence, and potentially also better CAPEX and OPEX. This is why some countries – notably Russia IIRC – are already building fast reactors today. The International Energy Agency sees the development of the first commercial breeders in the 2030-2040 timeframe. I would like to see data correlating US debt and trade deficit to the two generalized groups “services” and “industrial.” The strong sense among many that fewer and fewer workers are providing for more and more people that contribute less and less, is at the core of our political debate. The interesting personal comments of Darius Bentvels provide me a view I often try get from television travel shows. I hope I can share similar insight. I truly loved learning computers, Linux, and FreePascal (from the Netherlands), as well as microcontrollers. I call it civilization. But this is a real battle out here in the wilderness to keep very real wolves away from the door, and I don’t have time anymore. My kids all ran away to civilized parts of the world, and they love it. The forest and field growth is truly furious, and I have lost control of an area I have been enriching soil for decades. Yesterday a cement truck poured civilization into a frost footing for a barn. Just the driver and me, and the driver decided to sit in the truck; the driver was tired and underpaid, alright.. The general “service” workers sit in a climate controlled office earning big bucks and will not endure the sweat and bugs (prison work), no matter what you pay them. A bright spot is politicians are waking up to the biological climate connection. A bill now seems favored to assist forestry management, instead of assisting law firms. Basically, these academic debates, while essential, never seem to relate to my increasingly isolated interaction with climate, energy, resources, and labor. Am I disconnected, or are you disconnected? Thanks, that is an interesting perspective. Do you have any numbers for LCOE from a breeder reactor relative to a conventional nuclear reactor? Can breeder reactors counter the largely irrational socio-political headwinds currently hampering nuclear power? Yep, it is increasingly difficult to maintain proper perspective in our modern world. I am one of those service workers sitting in my climate controlled office and I have to focus very hard to ensure I don’t lose track of reality. Striving to understand where all of my material and energy consumption comes from, keeping up to date with developments in my third world country of birth, the occasional discussion with the farmers in my family and following a range of global trends all help in this regard. People on the ground always have the best perspective, but then again you cannot be on the ground in all the areas needed to form a holistic picture of where we stand regarding the multifaceted sustainability challenges we face today. I therefore feel that these academic debates can be very valuable provided that those who participate critically assess whether their views remain consistent with what is happening on the ground in the real world. Thanks for these interesting remarks. In Europe, living standards (measured by real income and GDP) started plateauing about one decade ago. Before that time people were still getting richer. It should also be mentioned that when I say that welfare (in terms of income) is stagnating, I don’t mean that this is the case for individuals who should still increase their income as they become older and more experienced. It should also be kept in mind that the energy efficiency measures you mention are not free. Because they cost more money, they will generally also consume more energy in manufacturing. There are plenty of numbers in the literature. See for example page 278 here. Fission nuclear power plants (breeder or not) are about as complex and materials intensive as a coal power plant and cost about the same. Any apparent cost difference is a symptom of irrational socio-political headwinds. Don’t forget that we can also greatly improve the sustainability of water cooled reactors by operating them as closed cycle near-breeders. Of course the Light-Water Breeder Experiment at the Shippingport reactor from 1977 to 1982 demonstrated that an LWR could operate as a break-even breeder on the thorium fuel cycle. Candu heavy water reactors can also be operated in this way. However, the thorium fuel cycle apparently makes fuel reprocessing even more expensive; hence no commercial use of thorium. Since that time there has been a realization that water cooled reactors can operate as near-breeders using the conventional closed uranium cycle. This paper (Edlund-1987) estimates a likely conversion ratio (amount of fissile material produced for each unit consumed) of 0.9, which would boost utilization efficiency of uranium ore from 0.6% to 4% (plenty high enough to allow use of the expensive but inexhaustible uranium in seawater). This newer paper (Andrew-2014) predicts break-even breeding with nitride fuel. Many of these concepts would work as retro-fits on existing reactors. Terrestrial Energy is working on a molten salt fueled reactor (uranium cycle, thermal spectrum near-breeder). They expect to drastically reduce the cost of fuel reprocessing (no solid fuel rods to fabricate), which should make reprocess cost effective. Since infinite multi-recycle is expected to be feasible, they expect to have nearly zero Pu in their waste stream. Even in once-thru mode, their reactor would boost the uranium utilization, and reduce plutonium waste by 6x. Terrapower takes the strategy of producing inexhaustible energy from a fast reactor, but using the once-through-cycle instead of reprocessing (their breeding ratio is high enough to throw away part of the produced Pu rather than recovering it via reprocessing; they leave about the same amount of Pu in the waste as once-thru LWRs). tried to delete because duplicate of above comment. I agree with your first paragraph and the first half of your second paragraph. USA workers more and more have to compete with both workers in less developed nations and robots. I feel the world has too much human population, and something will have to give. On cost alone, we should certainly make good use of our existing nuclear power plants, but wait until nuclear power industry solves problem of disposing of spent fuel rods to add any more. The last time world population dropped drastically, it started with a cold wet spell that was really bad for agriculture, followed by a bubonic plague epidemic probably aggravated by damage to human immune systems from bad weather and malnutrition due to crop failures from the bad weather. I am afraid if we concentrate too much on nuclear power without first solving its waste disposal problem the next major drop in world population is likely to be due to either a major nuclear power accident, or too much heat and drought for agriculture, or possibly war which would likely be nuclear war. Maybe we should try to reduce population growth with strictly chaperoned boarding schools plus if students graduate without jobs lined up, work houses like USA had around 1900s to stay with a very small monk cell sized room and food in a common dining room and be bused to very low wage jobs until they manage to get jobs that pay enough to live on. We might also need a strict one child per woman rule until population falls enough for remaining working age persons to be able to get jobs that pay enough to live on. Energy efficiency can achieve a doubling of effective energy available by getting twice as much goods and services for the same energy at best. From what it said on page 278 referenced lower down, I followed the link, changed page to 278 instead of 1 to index into the article and ended up on page 263. I had to scroll down to find page 278, and read several more following pages to get some sort of estimate of LCOE that implied it was necessary to build a much larger nuclear power plant and get economy of scale to get anywhere near such improvement in cost per megaWatthour. And that was compared to a light water reactor which already strickes me as huge. Also they don’t expect advanced nuclear reactors to get past pilot plant stage until about 2040. So meanwhile, we should work on wind, solar, geothermal, and hydrogen fuel cells to go with the wind and solar. By the way it seems according to another article on theenergycollective about fuel cells that a fuel cell can burn anything from pure hydrogen to pure natural gas and anything in between–so any really excess hydrogen can be mixed in with natural gas in a natural gas pipeline, either distribution or transmission. Maybe we can get some of something exotic like ocean thermal energy conversion while wating for the advanced nuclear reactors. Yeah, I think a lot of the people who attack the comments sections of articles on climate change to say “so what, climate is always changing” live their lives in air conditioned boxes. But Murphy’s Law will prevail. Someday the power will go out just when they want AC the most, and then they will appreciate what a few more degrees and a little more humidity means on an extreme day. And then they wish they had some solar panels and more efficient refrigerators. Grace, the disposal of nuclear waste is not the problem it’s often made out to be. All the high-level nuclear waste the world has created would fit on one football field stacked 7 yards deep. And newer designs like the Integral Fast Reactor (IFR) and molten-salt reactors are capable of generating 1/100 as much high-level waste by recycling most of it. Though we can’t pretend it’s not a responsibility (and an important one), it pales in comparison to generating lots of clean energy, and doing it quickly. My wife recently returned to St. Martin in the Caribbean where she visited many years ago. After a snorkeling outing she reported she saw “1/10 as many fish, or maybe less”. Captains on fishing boats confirm the marine ecosystem is hurting, with algal blooms bad enough to close some beaches. In less than 50 years we could see the end of entire oceanic food chains due to acidification from the atmospheric carbon we’re generating. It threatens them from the bottom up (plankton will be among the first to disappear). By the way, if you pointed out my wife was adding to the problem by flying six thousand miles on a jet, I won’t argue. That’s why I didn’t go with her. And which of us do you feel should never have been born? Doesn’t playing God make you uncomfortable? The idea of over-population is actually a viewpoint that’s stuck in the 1970s, and has been brought back by people who want to live off biomass, which doesn’t work on an Earth with billions of people. Clearly living on a densely populated planet will be different than living on a sparse one; we’ll adapt (for starters, don’t use biomass for energy, and eat less meat, or at least feed your livestock from non-biomass sources as with this product: Calysta Feedkind Protein, which is made from methane). But in the long run, population collapse due to low birth rate is an existential threat for humanity (judging by the birthrates in developed countries, which are all below the replacement rate!). This is absolutely impossible. We’ve had many nuclear accident and many people exposed to elevated radiation levels. Nuclear is simply not very dangerous. The area around Chernobyl is thriving with wildlife, and the people who did not evacuation are healthy (much healthier than people living near Soviet coal-fired plants). On the other hand, there is a very real risk of a massive die-off from climate change (at least in the worst-case scenarios), due to the fact that any mid-course correction that we implement will take decades to implement, and potentially centuries to take effect. Note that people normallyfight over land and land-based resources. Nuclear fuel is the only kind that can be economically stock-piled for a century, thus guaranteeing energy security to anyone who uses it. The use of renewables is dependent on owning the right piece of land, rather like fresh water (see Clayton’s remarks about the wind resource in Kansas), and storage of renewable energy is a huge problem, even at the one-day level. (1) if measuring the contribution of production TO living standards, the correction of shifting to median GDP at purchasing power parity captures substantially more critical differences than the shift to NDP. If a relatively large country that adds or loses 10% of GDP due to a change in the exchange rate with the money unit of measure, it certainly only gains or loses a small fraction of that in terms of material consumption, and if a country that adds or loses 10% of GDP due to changes in the income of the top 0.1% of its residents, its quite possible that there is absolutely no change in its standard of living at all. (2) And, yes, production only makes a contribution to standard of living, and it does appear that above some threshold level of median GDP per capita, standard of living depends much more on how effectively material means are used in support of the standard of living of people in a country. Wasting massive amounts of money on rampant health services price inflation, or rampant post-secondary education services price inflation, as in the United States, implies an increase in nominal GDP, but is unlikely to provide much benefit in terms of standard of living. Japan and Europe have trade surplusses which increases their energy consumprion (and CO2 emissions), whereas the US has trade deficits which decreases its energy consumption (and CO2 emissions). The graphs need to be adjusted to reflect that. Regarding the last two graphs, could you add 4 graphs, 2 for Europe and 2 for Japan, to see if the US experience is unique. From your lifestyle description, I deduce you use more Btus/yr, including for long distance travel, than you did 25 years ago, because many of the energy consuming activities you engage in, you likely did not engage in 25 years ago. Make a complete activities, etc., list for a person 25 years ago (such as yourself), and a list for a SAME AGE person to-day (such as your son). Add the energy for each activity item and for each good and service consumed, etc. Increasingly greater percentages of the soon to be 10 billion world population experiencing standing room only, living on top of each other, diseased, in poverty, starving, a la India? More and more boat people? The remaining fauna and flora extinct, because of destroyed habitats? Remembering that 25 years ago is 1990, so instead of watching streaming video on the streaming box on the LCD TV, replace watching a rented VHS movie on a old fashioned tube television, and driving the tape back and forth to the rental store. The driving sometime and ebiking the rest is not replacing taking an interurban or a tram, its replacing just driving. The smart phone is mostly not replaced with use of the landline telephone … its mostly replaced with more time in front of a fairly large tube television. There’s still a refrigerator running day and night, but its a less efficient one. For heating and cooling, in a region that did not have broad use of AC in 1990, there might be a net increase, but where central heat and air was commonplace, the description above of better insulation is a net saving. Even the energy consuming activity of reading this website is replacing the energy consuming activity of driving to the public library to read public affairs magazines. And for typing a letter to the editor, instead of doing it online, as now, I have my Commodore 64 running, the compact color TV is used as a monitor running, and the daisywheel printer plugged and ready to run. Two flights to Beijing a year probably swamp all of those savings, but for my energy use between returning from teaching Math in Grenada and heading off to grad school, it seems likely that its a net saving in pretty much every other category of activity. Indeed, a biomass economy doesn’t work with one billion people given the history of the 18th and 19th centuries which denuded many N. American and European forests, nearly drove the Bison, several whale species, and many other major species extinct when used for food or other resource. Good point about trade surplusses and deficits. I don’t know about good sources of data for the energy implications, but quite a lot of work has been done on CO2 emission adjustments based on balance of trade. If this is accounted for, US emissions should increase by about 0.75 Gt/year and Chinese emissions should decrease by about 1.15 Gt/year – both about 15% of repective total emissions. Interestingly, both Europe and Japan are net importers of emissions. Even though they may have positive balance of trade (sometimes) they import much more energy and emissions intensive goods and services than they export. Unfortunately, median income data for Europe and Japan is more difficult to come by. However, I think that median income in these regions has moved much more closely with GDP than in the US (probably part of the reason why growth in these regions is so weak), implying that the energy intensity graph in this article should be a good indication. On decoupling welfare from energy growth, there is one aspect I hardly ever see appreciated or discussed. It is the question of why there is concern about energy growth in the first place? Superficially, the concern is there because the way we produce energy – mostly from fossil fuels – is extremely damaging to the environment, causing in aggregate at least half of all environmental damage. But this does not necessarily mean that energy production needs to be reduced. Rather it means in fact that the damage caused by energy production needs to be reduced. This is a very important difference in my opinion, because the scope for reducing energy production is fundamentally limited by the demand for energy implied by the growing needs and wants of 7-10 billion people. Ongoing improvements in efficiency and lifestyle could perhaps lead to a reduction of 50% of energy to deliver the same level of meeting needs and wants, but clearly this reduction is never going to be 100%. In other words, even if we decouple economic growth from energy growth as much as possible, and in recognition of the fact that the global economy will double at least several times in this century alone, environmental damage is set to increase from current levels which are already unsustainable, even if we achieve very ambitions ‘decoupling’ goals. Conversely, the scope for reducing the damage caused by energy production is essentially 100%. It can be done by making all energy technologies which consume planetary services in one form or another illegal, which is all energy technologies except nuclear power. The added benefit would be permanently low energy prices. This issue is relevant I believe because government policy intending to improve GDP growth while limiting energy growth is inherently risky. While the intention of such policies is essentially to improve productivity without increasing consumption (of energy, resources, etc. ), there could well be unintended consequences. For example: policies aimed at improving energy efficiency in industry by increasing energy taxes on industry (a policy which is at this moment pushed hard by the ‘greens’ in my country) could lead to energy intensive industry simply shifting investment to foreign countries. so even if such industry exits are compensated by national growth in ‘higher added value’ industries (i.e. 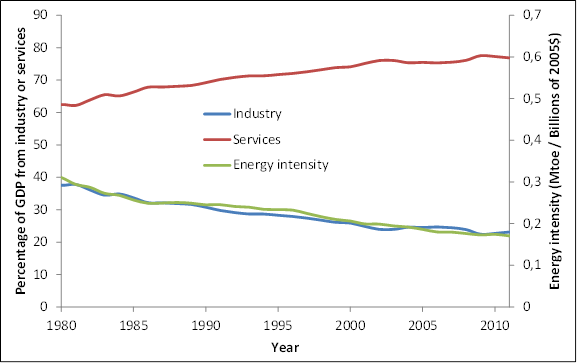 non energy intensive industry), for the global environment as a whole there is zero benefit. Another example is where policies are embraced which essentially make it illegal to use energy on the grounds that it is a ‘waste’. But waste is in the eye of the beholder. For example, building energy codes are already so stringent that air humidification has all but dissappeared from HVAC systems in new construction. This means that during winter time, the room air becomes so dry that some people suffer from irritation of eyes and mucous membranes, causing discomfort and falling productivity. This has been documented, but the ‘energy savings’ by eliminating humidification systems from buildings in order to satisfy stringent energy consumption limits in the building code are judged to be more important than the welfare and productivity of the building occupants. Assuming that the workers compensate their productivity-loss by working longer hours on days when the indoor comfort is satisfactory, the effect of this policy will be that GDP is maintained while energy consumption has fallen. But the quality of life of the building occupants has been sacrificed to achieve this ‘decoupling’. If anyone gets a nuclear reactor that eats the leftover spent fuel rods from our current light water reactors and doesn’t keep running into major cost over-runs, OK. I will be glad to have it clean up the leftovers from our current model of reactor. But I don’t want any more light water nuclear reactors with major cots over-runs. World population is still increasing provoking Malthusian dread in me. I would much prefer birth control and/or tight chaperonage to any deliberate attempt to kill persons already alive now. It would take a major breaktrhough in either agriculture (maybe algae whether selectively bred for heat tolerance and good human nutrition without any tendency to get toxic when it gets hot or same goals with GE) or chemical engineering. Maybe our American junk food makers can figure out how to make good tasting junk food with better nutrition out of either algae or chemical engineering than what we have right now. So far we aren’t fighting over desert without oil under it. And I hope we will have enough sense to learn to negotiate sharing if anybody does make a viable attempt to fight over desert (either hot and sunny or cold and windy). Nathan, FYI : Calysta Feedkind Protein is made from fracked/fossil methane. Biomass would be a vast environmental improvement, unless it was methane destined to be flared anyway. Lots of daunting numbers and concepts to come to grips with in this third installment of an Energy and the Information Infrastructure series by Manhattan Institute Senior Fellow Mark Mills. The report includes five case studies highlighting the ways and means traditional utility business models can be aligned with technological trends and customers' and society-wide needs.